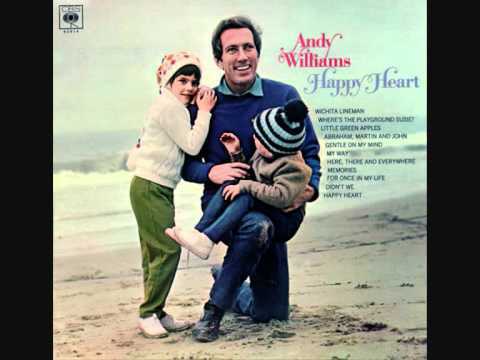 Andy Williams: another very underrated vocalist with great technique. Any other fans? Recently I've been discovering the repertoire of classic pop vocalists like Tom Jones, Frank Sinatra and Frankie Valli. One of my all time favorite singers, however, is Andy Williams. Most of his repertoire is either cheesy or borderline maudlin but he is very fun to listen to nonetheless. His technique does seem to be pretty solid. He sings light and bright in his low notes; in fact, he seems to hit alot of high notes in a very gentle head voice/chest mix. However, if you listen to a song like "Where do I begin? ", he has an amazing full, open throated tone in his high notes. However, one thing many people do not realize is that he had a FANTASTIC full voice upper range extending up to a C#5 (in an unusually funky song for him: a cover of Stevie Wonder's "For Once In my Life." I think he just chose not to sing up there too often because of the style of his music, but when he does a hit a really high note, it's unexpected and amazing. Anyone have any thoughts or comments on his technique? C#5 is far above anything I would have expected Andy Williams to have been able to sing effortlessly. He seems to take it in stride. Yeah, Frankie Valli had some interesting vocals as well. The fact that Frank Sinatra sold millions of records says that he was definitely doing something that appealed to a lot of people during his heyday. I was asked to do my Green, Green Grass of Home (Tom Jones style) at one of my gigs last weekend. It brought the house down. He drops the note down to an Ab or something on the live version. of the voice, I instinctively knew he was a cut above many others at the time. I've always been of the opinion that he was vastly underrated as a singer. I remain a huge fan. Funny story. My Mother, and my Aunt used to go see Englebert Humperdink in Canada when he would play there, and my aunt used to take extra undergarments to throw at him while he was performing ha ha. My Aunt was pretty wild for her day, but a great funny lady.